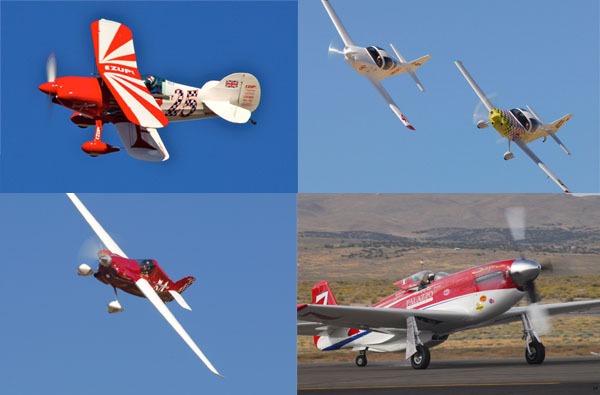 Reno, Nev. � The Reno Air Racing Association (RARA) has released preliminary results for the 2015 National Championship Air Races and is projecting a profit of over $100,000. Results will be finalized at year-end. The original budget for 2015 called for a $630,000 loss, so the projected profit is very good news for the event. Over 150,000 attended this year�s event with pilots racing in six classes, an airshow featuring Tora Tora Tora!, a reenactment of the events of Pearl Harbor, and many other displays including static aircraft and the expanded Drone Zone. Veteran Robert �Hoot� Gibson capped off the successful event by winning the coveted Unlimited Gold Race in Strega, unseating six-time winner, Steve Hinton, in Voodoo. Named one of the 10 best Air Shows in the WORLD by USA Today! The world�s first �jet-powered man� will take to the skies! Yves Rossy, known as �Jetman, � will make only two appearances in the U.S. and the National Championship Air Races is one of his stops! Made of carbon-Kevlar material, the �jetwing� is powered by four jet engines and can reach speeds of 150 mph. Jetman controlls the throttle with one hand and uses his body to steer, pitch and descend. Tickets officially go on sale for the 50th Annual National Championship Air Races on March 1st. Go to the website links below, or call their office (775)972-6663. Office hours are 8am until 4:30pm pst. Order early to ensure you have great seats. Everyone is still going to call it the Reno Air Races, but for official purposes this popular event is now known as "TravelNevada.com Reno National Championship Air Races and Air Show Presented by Breitling." The name change revolves around sponsorship money. The Nevada Commission on Tourism (NCOT) is theTravelNevada.com part. This is the official Nevada state travel and tourism website. They get to be in the official title of the event due to a three year sponsorship worth $600,000. Watch company Breitling, which has been a big sponsor for many years, is providing $200,000 toward the 2012 event. 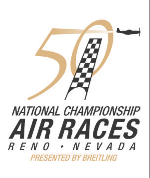 Though not a title sponsor with its name on a billboard, our own Reno - Sparks Convention and Visitors Authority (RSCVA) is contributing $150,000 to the 2012 Reno Air Races. A major sponsor is being sought for the 50th anniversary event next year, but has yet to be landed. Should none be secured, NCOT will continue with its support agreement through 2014. The Reno Air Races have always been acknowledged to be a dangerous event, but is it just too risky to continue? Thusfar, the answers to this poll are heavily in favor of continuing the event. What do you think? Sources: Reno Air Racing Association, Reno Gazette-Journal. The 47th edition of the National Championship Air Races & Air Show, held at Reno/Stead Field, September 15-19, 2010 was greeted with sunny days and excited fans. All the week's Heat Races left the crowds wanting more on the build up to 'Gold Race Sunday'. Everything looked promising until Sunday when weather forced an unexpected change of events. High and gusting winds unfortunately caused cancellation of the Breitling Unlimited Gold race for the first time in the 47 year history of the Races. Steven Hinton of Bakersfield, CA, pilot of Race #7 "Strega" was declared champion of the Unlimited Class by qualifying position. The winds also forced stoppage of the T-6 Class Gold race and top qualifier, Dennis Buehn of Carson City, NV, received the T-6 trophy flying Midnight Miss III, Race #43. What a show! Flying events include Bud Granley's Harvard and Fouga Jet, Manfred Radius' Sail Plane, Eric Beard's Russian Thunder Yak 54, Ken Fowler's Harmon Rocket, Julie Clark's Mopar T-34, Gene Soucy's Showcat Biplane, Teresa Stokes' Wingwalker, Jim Leroy's Bulldog-Pitts and Tom Wade's Edge 540. Demonstration teams feature the famous CAF Snowbirds. Military Aircraft in flight include CF-18 and A-10 demos, plus F-15, B1-B bomber and an F-18. Watch for further reports as the big show approaches. The Abbotsford International Airshow was a three day spectacular set in the heart of the beautiful Fraser Valley with Mt Baker as a backdrop. It is one of the premier shows in North America in terms of attendance and aircraft presence. In the 1970's, Abbotsford was designated "Canada's National Airshow" by the Government of Canada. The average attendance of the three day event is 200,000+ in addition we host representatives from approximately 25 countries, including Ambassadors, Consuls General, and Military Attaches. Most, if not all the major airshow performers and military demonstration teams have performed as part of the Abbotsford Airshow including the CAF Snowbirds, USAF Thunderbirds, USN Blue Angels, Patrouille de France, Frecci Tricilori (Italy) Chile, and the Russian Knights. Over the years, it has also become a tradition for the Abbotsford Airshow to showcase much of the latest aviation technology and new aircraft. In 1986, Abbotsford became the first North American show to host five world-class demonstration teams. In 1989 and 1993, we saw the first U.S.S.R. contingent to visit North America with MIG 29's, an IL-76 and the AN-225, along with in 1992, the only Canadian appearance of the "Russian Knights" SU-27 demonstration team. Our 37th Airshow Performers included: Sean Tucker, Air Combat Canada, Bud Granley, Manfred Radius, Delmar Benjamin, Julie Clark, Donn Richardon, Greg Poe. We have two demonstration teams booked which of course includes the Canadian Air Forces Snowbirds and for the first time, the F-104 Starfighters. Our request for a large military presence has been positively received by the US and Canadian Air Force. These requests include an AV-8B Harrier Demonstration, F-14, F-16,CF-18m A-10,KC-135 Air Refueling Demonstration and more. In 1962 a small group of Airshow Enthusiasts got together and decided to put on an air show. These people were members of the local Rotary Club and the Abbotsford Flying Club. These clubs sponsored the first show and went on to host a second show in 1963. The show continued to grow in the 60's becoming a rather large event. At the close of the 1966 show it was decided that a special show would be planned for the 1967 centennial year. The Centennial Air Show Society was formed. Upon closing a successful 1967 show, members of the Centennial Air Show Society decided to continue on a more permanent basis. 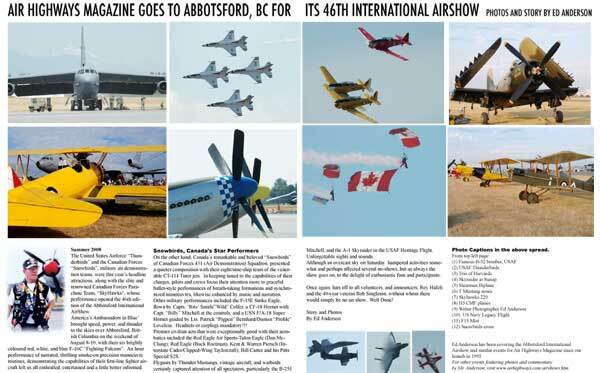 The Abbotsford International Air Show was born! The Abbotsford International Airshow Society is a non profit society whose purpose is to produce a flying event that will be enjoyable entertainment for those that attend, promote aviation and operate financially so as to reproduce the event on an annual basis. Each year hundreds of volunteers provide the talent and hard work while a variety of sponsors and donors provide the necessary funding for this special event. The volunteer contingent numbers some 1500. The volunteers are made up of many who volunteer directly to the Airshow organization and an additional 450 and up that come through the 30 or more service club organizations such as Rotary, Kiwanis, Salvation Army, Big Brothers, Scouts, Guides, Cadets, MSA Hospital and other community organizations. The Service Clubs over the last few years have received over $1,000,000.00 from the Abbotsford Airshow to distribute to the various causes that they support. The Abbotsford International Airshow is a source of pride for Abbotsford and all of British Columbia and has been attended by of up to 250,000 people in a three day weekend. The Abbotsford Airshow will continue to enrich our community and thrill and inspire thousands of people each year. Air Highways Magazine wants to thank MTU Maintenance Canada, division of Daimler-Chrysler Aerospace and ICC- International Cargo Carriers for their hospitality. It was our greatest airshow experience ever. The sky was filled with flying ACES, as participants joined hands with the Royal Canadian Airforce to celebrate its 75th DIAMOND Anniversary. Tradex: Exhibition centre of Mighty Fraser Country.